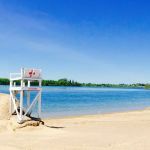 Ask fellow campers about "Lisbon Beach & Campground" and nearby attractions. Stayed 4 nights on this terrific campground. People friendly, sites generous, views spectacular. Site was very level grass surface. We camped at Lisbon Beach & Campground in a Motorhome. Only 8.5 miles from downtown Ogdensburg where restaurants, Walmart, grocery and Lowes available. Highway 37 has wide bike lane in both directions. Rode our bikes every day into town. Sites are spacious on a grassy field but without shrubbery between. There are trees between every other site. We were across the park road from the St Lawrence River with most adjacent sites occupied by seasonal campers with lots of water gear. There is a boat launch there. It is a short drive from the Ogdensburg International Bridge. We camped at Lisbon Beach & Campground in a Travel Trailer. We enjoyed the Remington Museum in Ogdensburg. Very nice large park right on the St. Lawrence River. This is a City of Lisbon owned park. Staffed by wonderful, accommodating young and old employees, it has 100 grassy sites, in any configuration you need, full, partial or dry camping. If you have kids, there is a playground, and a fully life guarded wonderful swimming beach. For boaters, there is a boat launch with 3 docks and room to store your boat when not using. sites are very large. Can't say enough nice things about this park. Wal Mart and Price Chopper groceries (awesome beautiful grocery store) 6 miles to the west. For gamblers, Mohawk Tribal casino about 20 miles to the east. Great park! We camped at Lisbon Beach & Campground in a Fifth Wheel. This campground surprised us by the size, and the fact that it was right on the St. Lawrence River. It was after season, so we didn't feel hemmed in by other campers. Large, spacious sites, and grass everywhere. Could take the dogs on a nice long walk. Didn't use the facilities, but the grounds were clean and well cared for. We had a back-in full hook-up for $34, and I was very pleased. Would stay again, and recommend to all. Interior roads very easy. We camped at Lisbon Beach & Campground in a Motorhome. Nearly all sites were sunny, pleasant location, vast, well mowed grassy areas that were well tended - great for walking dogs. Seagulls loved the location, right next to the river, we watched with amusement at camp host who exercised his setter several times a day, chasing the gulls away, seemed very effective. The host was extremely helpful and guided us to our site - clean facilities. Our spot required only minor leveling, no obvious traffic noise from the HWY. We camped at Lisbon Beach & Campground in a Motorhome. Pull thru , 50 amp FHU next to river, very scenic. Nice utilities and roads. Quiet and we will return We camped at Lisbon Beach & Campground in a Motorhome. First, the good: the park is a huge grassy area right on the St. Lawrence River, with shade trees at most sites. The customer service was outstanding and all of the staff very friendly. The sites were quite large, and although not very private, at least you weren't parked on top of your neighbors. The park is heavily patronized by day visitors, so its a little noisy during the day, but wonderfully quiet at night. The bad: the site I was at and the one next to it had no water hookups, so the staff ran several hundred feet of their hose to our trailers. The water was very filmy for a day, probably due to sediment in the hose. Also, the water was too hot to shower with except early in the morning or late at night, because the hose was lying out in the sun. Since there were no sewers at the sites, you couldn't just run the hot water through till you got to cool water, because there was so much water in the length of hose they had. The water pressure was fine, though. Another issue I had was with the Wi-Fi. I don't mind when I get somewhere with no Wi-Fi, but I do mind being sold Wi-Fi by a third party who does not provide what is offered. The Wi-Fi service is run by a young man who does not have the skills required to keep it running. Also, he would not return phone calls or answer his phone most of the time. I will have to go to my credit card company for a refund. I do not think the park should keep sponsoring this individual. The service crashed for over a day and the young man told me he could not fix it because it was Sunday. It still was not fixed Monday. Finally, the seasonal residents next to me had several dogs that barked continually while I was there. I think the park management should handle this, rather than making visitors responsible for complaining to people who are obviously not well mannered in the first place. For these reasons, a park with fairly good potential was not the greatest experience for me. We camped at Lisbon Beach & Campground in a Travel Trailer. Very nice family park right along the St. Lawrence River. Nice beach and lots of activities for families. Very busy on the weekends but much quieter during the week. Staff and Park Manager were excellent and very accommodating when we asked to stay an additional night. Some sites are little unlevel, including ours. Our front tires were off the ground. Would stay again. We camped at Lisbon Beach & Campground in a Motorhome. The campground is great. Nice sites with plenty of room between them. Nice areas to walk and take the dogs. Good central .location for exploring the area. Nice view of the river. Half the sites have water hook up on the wrong side so bring plenty of hose. If you plan your visit near the end of May BEWARE of the shad fly infestation. Makes walking driving or sitting out next to impossible. Next time we will come at another time of year. We camped at Lisbon Beach & Campground in a Fifth Wheel. Park is on main highway, no road noise. Roads are paved, large sites are grass with a few shade trees. Power, and water was good. Cell (AT&T) weak. We would recommend this park. We camped at Lisbon Beach & Campground in a Motorhome. An adequate camp ground over looking the St. Lawrence River and near the bridge into Canada at Ogdensburg - about 1 hr south of Ottawa. Grassy sites, but no shade. No Wi-Fi, but good Verizon cellular signal. Buy your diesel here before crossing into Ontario - it's expensive, but better than in Ca. We camped at Lisbon Beach & Campground in a Travel Trailer. We camped here for 2 nights. We were hoping for a waterfront lot but there are none. We did get a wonderful view of the river though. The waterfront is actually too hilly to camp on, but we did walk along there and it's nice and shady. We didn't go to the beach area but it was quite busy and looked very nice. There are 2 lifeguards there at all times. The only negative was the scarcity of shade trees. We camped at Lisbon Beach & Campground in a Motorhome. All grass sites. Water connection is shared with other campers but pressure was good. Sites are level and all grass so the rain didn't make it muddy at all. We had 30amp and it also held up well. Lots of seasonal and local. The manager was very friendly and all the campers as well. They made sure we had a site with a view of the river. Several TV stations on antenna and Verizon phones worked well. Also Sprint MiFi worked but roamed on another network. Would stay again if in the area. We camped at Lisbon Beach & Campground in a Fifth Wheel. Campground was a park setting with nice grassy sites and lots of open space, no need for an outdoor carpet, and had good drainage. Sites are big and not overcrowded. The beach is good and water clean; 3 life guards were present which is nice with kids. We stayed on long weekend, and park was quiet at night. Would definitely stay here again. We camped at Lisbon Beach & Campground in a Travel Trailer. 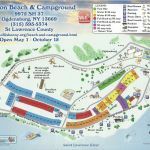 This campground is pleasantly situated on the banks of the St. Lawrence Seaway near Ogdensburg, NY. The camp director is very helpful and can direct you to local attractions and eating spots. He usually keeps his own 5th wheel RV parked on the campground so the security is fine. The campground is mostly open with gravel pads for RVs. Nice beach area for swimming during warm weather. TV reception is fine for a number of Canadian stations across the river. We would certainly return here on future trips. We camped at Lisbon Beach & Campground in a Travel Trailer. 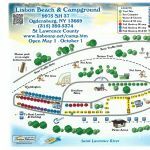 Are you affiliated with Lisbon Beach & Campground ?